1959-04 The first course for Natives in the Durban district, on the banks of the Umgeni River, was opened by the Mayor, Mr W E Shaw. It formed part of the Umgeni Bantu Sports Grounds. 1959-11 At a meeting of representatives of the Durban Indian Sports Ground Association and the Durban City Engineer regarding the development of the remaining portion of the Springfield Sports Grounds, a proposal by the City Engineer was that the nine hole golf course could be laid out first. An additional 11 acres of ground had been provided so as to be able to establish an independent course and an amount of 4000 pounds (R8000) had been allotted for the purpose. The cricketers were not so happy about this! 1959-11 Mention was made in a press report of the Papwa Trust Fund, set up to raise sufficient money to send Papwa to defend his Dutch Open title and to compete in other events overseas. This was a big task but the committee comprising Louis Nelson (chairman), R S Govender (secretary/treasurer), E I Haffejee, G Pumpy Naidoo and T Lutchman were confident of a generous response being made by the public. A cheque for 25 pounds (R50) had been received from Papwa’s employers. A booklet on Papwa was also due to be released. 1959-12 The Natal Midlands Non-European Championship, played at the Maritzburg Country Club, resulted in a tie between Lawrence Buthelezi, Howick Caddie Master, and Papwa Sewgolum. Papwa holed a 20m shot to catch Buthelezi on the last hole. The two played-off some days later, Papwa coming through to win with scores of 69 73 - 142 as against Buthelezi’s 79 77 - 156. 1960-06 A provincial golf body to be known as the Natal Golf Association was formed at an inaugural meeting of the Durban Indian Golf Club and the Durban and District African Golf Association to control non-White golf in Natal. An interim committee was appointed to frame a constitution and to organise the new body: E D Makoku (chairman), D Kalideen (vice-chairman), S Madaramuthoo (secretary/treasurer), Louis Nelson and Patrick Ngobozi. The urgency of forming a united body was because the SA Non-European Golf Association do not allow non-affiliated centres to participate in their national championships. 1961-01 At Maritzburg Country Club Sewsunker Sewgolum won the Natal Non-European Open for the fourth year in succession scoring 74 72 75 73 - 294, including a one-under-par 72 in the pouring rain. The runner-up was R T Singh, a veteran Indian golfer, on 76 79 79 79 -313. Simon Cox Hlapo and P Mazibuko, both from the Transvaal, were third. Papwa won the trophy given by Mr K D Barnes, Vice-President of the Natal Golf Association. The first 12 players received either cash prizes or gift vouchers thanks to a sponsorship of 150 pounds (R300) from W and A Gilbey. In the amateur section the three Naidoo brothers - M V, R V, and V S – took the first three places with scores of 320, 322 and 325. In the team event Papwa (146) and V P L Paul (169) won the Juggernath Trophy for the best score over the first 36 holes. The championship was played at the end of December 1960 and attracted 110 entries. It was run by the newly formed Natal Golfers’ Association. 1961-10 Played over the Bantu course at Umgeni, the F.O.S.A. Open Tournament in 1961 was won by Shan Poonsammy with scores of 71 74 - 145. There was a tie for second place between Papwa Sewgolum and Caesar Shakane, both on 148. Shakane won the sudden-death playoff. 1961-12 A large crown followed a friendly fourball match at Umbogintwini which included E J (Topper) Boyd and three Indians, Solanki, who partnered Boyd, Papwa Sewgolum and R T Singh. Receiving five strokes each, Boyd and Solanki won the match 2 and 1. The four players scored an astonishing 17 birdies in the last 14 holes. The 1961 Championship got off to a bad start when, on the very eve of the meeting, through an unfortunate misunderstanding, the Club was ordered by the Government not to stage it. The application to do so had been turned down. There was all-round satisfaction when, later, largely owing to the mediation of Mr. Harry Lewis, M.P., Mr. J. L. Rice and Mr. Louis Nelson, president Natal (Indian) Golf Association, Mr. J. E. Toop, Umbogintwini Club chair­man, received a phone call at midnight which told him of the reversal of the ban. It was a big task notifying distant competitors of the change. But 'twas done, and it meant that many competitors had to drive through the night in order to answer to the starter's call - and to play 36 holes in vile weather, too. You cannot but help admire such enthusiasm, whatever you might think of what led up to the necessity for such terrible hastle. Right from the start of the interest taken in Non-European golf the members of the golf section of the Umbogintwini Club have been most sympathetic towards the movement, being firm believers in the old adage that "fair play is bonny play". They were the first to offer their course for the South African Non-European Champion­ship last year when it was known that the Association were looking for a Natal course. The privilege of being hosts finally resting with Kloof C.C. and Royal Durban. And after all the necessary formalities had been observed it was Umbogintwini that offered the Natal Non-Europeans the use of their course for their Natal Open, the offer being gratefully accepted. It is not uninteresting to add that about a week before the championship tourna­ment the new municipal course for Non­-Europeans at Springfield was officially opened for play. As previously mentioned in this journal it can by no means measure up to cham­pionship standards, even if there were eighteen holes instead of nine. It is an advance on what the Non-Europeans had before, but every European who knows the position will tell you that these players deserve something very much better. 1962-02 The question of building a clubhouse at the Springfield was being considered. It was felt that a clubhouse would lead to an increase in membership. The announcement was made that the Natal Non-European Championship scheduled for December 1962 would be held at Kloof Country Club, provided always that the necessary permission had been obtained. There was no non-white course that was anywhere near championship standard and the use of a ‘white’ course was important to the success of the event. 1962-09 The Durban African Golf Association inaugurated a 36-hole Durban African competition for the Mainstay Floating Trophy. 1963-01 Following on the Natal Non-European Championship at Kloof CC over the Christmas holidays in 1962, the SWD N-E Championships were played at Oudtshoorn after Christmas and then in the New Year the SA N-E Open was played at Walmer in Port Elizabeth. Some of the Natal golfers were able to play in all three events. 1963-03 Mr Louis Nelson, President of the Natal Golf Association and Chairman of the Durban Indian Club, was reported as having said that the time was coming for the non-Whites of Natal to have a full 18-hole course like the one at Athlone for the Coloureds and at Pimville for the Africans. Meanwhile plans were afoot to give the restricted nine-hole course at Springfield a big face-lift and, if funds could be found, to build a clubhouse and professionals shop. 1963-07 The Circle Country Club made a request to the Natal Golf Union that they be allowed to host the Natal Non-European Championship in December 1963. This was granted, subject only to application being made to the Department of Community Development. 1964-03 The championship held at Circle CC was a great success and everyone was most impressed by the splendid manner in which the tournament was run. No slow play was tolerated and Mr Louis Nelson kept a close eye on the field to ensure that no one was lagging behind. Again, there are no scores on record; again it was probably Papwa who won? 1965-01 The 1964 Natal Non-European Championship was played at Kloof Country Club and was won by Raydmuth Rajdaw on a score of 293. He finished one shot ahead of Papwa Sewgolum (294) with Cox Hlapo (297) in third place. This was one of the rare occasions that the title was not won by Papwa. An exhibition match was arranged at Greyton Country Club with Papwa Sewgolum playing the better ball of Teddy Irwin, a former SA Amateur Champion, and D Roydon-Turner. At the end of the day Papwa was presented with a cheque by the captain of the club but for how much is not stated. 1965-08 Simultaneous with the opening of the new Umlazi Bantu township the Minister of Bantu Administration and Development, Mr M D C de Wet Nel, also opened the first modern Bantu golf course. It was only nine holes but it was stated that a further nine “will be completed shortly”. The course was designed by Bob Grimsdell and built under his supervision. Mention has been made of the inauguration in September 1962 of the Mainstay Floating Trophy. Thanks to the Umkomaas Golf Club and the co-operation of the Ministry of Bantu Development, 61 Bantu competed for the Trophy for the second time, played as before as a 36-hole stroke play competition. The tournament was sponsored and organised by Henry Taylor & Ries Ltd. They put up all the prizes and trophies, laid on transport to the course and provided meals and refreshments during the day. Winner of the best gross was P Mhlongo (77 79 – 156) and the best net G Maduna (140 off 12 handicap). 1965-12 The R500 Thunderbird Classic in 1965 was played over the Non-White course at Springfield and was won by Papwa Sewgolum on a score of 70 72 72 72 - 286. He was followed by A Collins on 76 n69 72 74 - 291 and P Paul on 75 73 76 76 - 300. The prizes were presented by Mr A P Govender, executive member of the Durban Golf Club, presumably the Durban Indian Golf Club. Bad weather marred some good golf. However, there was tremendous enthusiasm and more than 100 golfers took part. Forty qualified for the final 36 holes. In the team of four inter-club event the winners were R Tiney (70), A Collin (85), P L Paul (77) and L Nelson (82) with a total of 314. The pairs was won by Papwa (143) and D L Solanki (156) for a total of 299. Papwa was awarded the K D Barnes Floating Trophy and a sponsored cash prize of R60 while D Motati received the Louis Nelson Trophy and an undisclosed cash prize. R Anooplal, the winner of the 1964 amateur title and second in 1965, was voted the most promising golfer. It was noted that Papwa would not be taking part in the SA Non-European Open at Bloemfontein early in the New Year because he would be playing on the South African circuit. This is exactly what he did. In the Natal team event D Solanki (159) and Papwa (144) beat Reggie Naidoo (155) and M V Naidoo (150) by two strokes. Note! There is some uncertainty as to whether or not these results are for the December 1966 championships. The clue is that the Open and Amateur titles in 1965 were won by Sewgolum and R Naidoo. In the report in the Natal Witness on the above events, these two are both described as being holders of the titles. That being so, we can only assume that these results are for 1966. A Collin (147) and J Ranjith (146) won the pairs event whie the team of four was won by D L Solanki (80), Papwa (71), A Collin (70) and L Buthelezi (80). 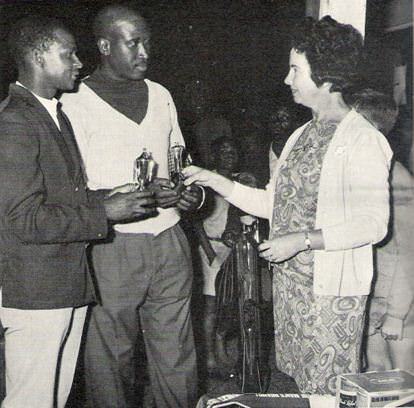 1968-01 A special 72-hole tournament organised by the SA Non-European Golf Association and played at the Dundee golf course was won by Simon Cox Hlapo with a score of 291. Second was R Mogoerane (298), third was J Sithele (300) and fourth Vincent Tshabalala (301). 1968-06 The Natal Mercury carried a report that the R55 000 18-hole championship golf course at Umlazi African Township would soon be ready for use. The first nine was already in play. The new Umlazi Golf Club held its inaugural tournament recently. This toumament which was sponsored by the South African Breweries and Henry Tayler & Ries Ltd. jointly, and the Carling Mainstay Tournament, attracted an entry of 75 Bantu, from many parts of Natal. The winner of the best gross trophy was P. Mhlongo, with a score of 80 for the eighteen holes. The best net winner was O. Ngweba with a score of 68. Ngweba played off 13. This new golf course is the very first championship course for Bantu in South Africa; and all credit to the Govemment Bantu Affairs Department for not only have they provided a magnificent setting for the course at Umlazi, near Durban, but they employed Mr. Robert Grimsdell to design it. A golf course without a “l9th hole" is not much cop, and a very fine clubhouse, which stands on a commanding hill with splendid views of the course and the Indian Ocean, has been built. 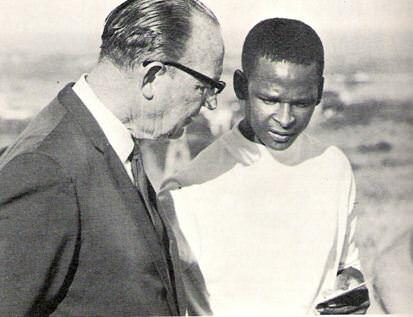 ABOVE: Former soccer Springbok Mr. R. Gibson, present captain of the Huletrts Country Club, was the guest of the Bantu Affairs Commissioner, Mn A. Noble, at the recent opening of the golf course for Bantu at Umlazi. Mr. Gibson is seen here with best gross winner P. Mhlongo. BELOW: The newly opened course for Bantu at Umlazi was the venue for a very sucessful tournament recently. The winner (best gross) was P. Mhlongo (left while the prize for the best net went to O. Hlengwa. The prizes were presented by Mrs. Strydom, wife of Township Manager Mr. A. Strydom. 1970-01 Daddy Naidoo won the 36-hole F.O.S.A. tournament at the Springfield course. Rounds of 68 71 - 139 placed him three shots clear of Harold Sukraj who was second on 142. J Buchen was third on 144 with A Collins and L Buthelezi tied fourth on 146.